There are many tricky decisions to be made when writing rules. The most important (or at least to the tUGS team) is that of overpower. Too much power spoils the broth…or something like that. Flamekebab gives us his personal insight into what he refers to as “Doom Fortress syndrome”, so passionate about it, it’s delivered straight from his personal blog by E-Grots. When working on new stuff for Gorkamorka I always try to avoid what I think of as “Doom Fortress Syndrome” – creating something so ridiculously overpowered that fielding it isn’t even remotely possible. Generally we keep this sort of thing in check during our idea jams although a bit of craziness is of course welcome but most of that stuff ends up on the proverbial cutting room floor. In order to maintain the balance we try our best to follow the principles mentioned on the last page of Da Uvver Book (“Gorkamorka Designer’s Notes”). Shooting is not supposed to be particularly deadly, for example, so we try not to introduce anything that will mean that a faction can dominate the board. When we wrote the rules for the Dust Rat Long Rifle we made it expensive enough that a mob wishing to field several of them would end up forgoing much more versatile kit due to the sheer expense of the weapon, balancing its strength. This is pretty much the reason why under normal circumstances you’ll not find us putting armour values over 10 on things – barely anything can penetrate vehicles that tough. For this reason you won’t find us encouraging you to field battlewagons, tanks, or mega tanks for that matter. They look awesome, but the balance issues they raise risk the game turning into an arms race. Essentially it’s about trying to ensure an even playing field – no one faction should even be the obvious best choice. It always annoys me when people say “Which side/character is best? !” for a videogame. The more sensible ones mean “Which do you think would suit someone who hasn’t played this before?” but a large number seem to be under the impression that there is one character or faction that is superior to all the others. In a well balanced game that kind of question should be gibberish! The arms race I mentioned would mean that mobs that aren’t able to easily field powerful weapons would end up on the losing end much of the time. 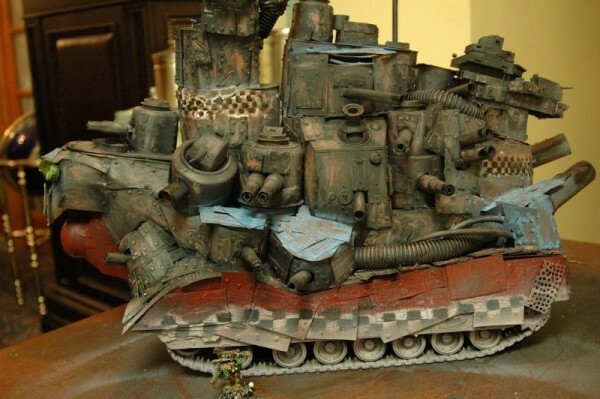 Sure, Orks can get hold of Rokkit launchers to try to crack the armour on a tough target, but what about Rebel Grots? 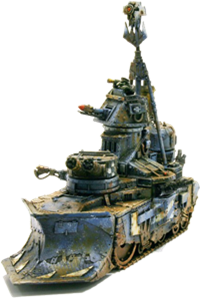 It’s a similar principle behind my opposition to Killa Kans in Gorkamorka – as a scenario component they’re fine, but as a regular mob member a Killa Kan causes problems. Gorkamorka is unique amongst the Games Workshop skirmish games (as far as I know) in that it has a mechanic known as “Da Rollin’ Road” (see page 96 of Da Uvver Book). This little set of rules means that one can have chases, races, and so on, which I think is rather awesome. Unfortunately if you cannot thrust then you are at a bit of a disadvantage – and walkers aren’t exactly known for their speed. This is pretty much the only problem I see with the Snorta rules, but even then they can run like the Muties can which tends to help things. To conclude I’ll say this – the ethos of a game is vitally important when crafting new rules. Just because you can add it doesn’t mean it’ll fit with how the game was intended to be played. Sometimes you’ve just got to say “well that’s pretty damn cool, but I just don’t think it’ll work in practice”. You don’t have to say it, actually, but it’s a principle I encourage you to adopt. And there you have it! If anyone has any thoughts on the matter (and we hope you do), please leave a comment. This entry was posted on Monday, January 31st, 2011 at 00:41	and is filed under Design Notes, General. You can follow any responses to this entry through the RSS 2.0 feed. You can leave a response, or trackback from your own site. This is also why Gorkamorka doesn’t have any armour saves better than 4+, I believe. Even though there are save modifiers, your typical boy isn’t going to have the S5 necessary to make a dent in Mega Armour. Kans would probably work if you could mount them up in said Doom Fortresses and speed them around that way. But then you’re not really playing Gorkamorka anymore, since the various big killy things on the board completely overshadow the boyz and their skills and experience. I would like to see Snortas with chariots or something, though, for some variety. Chariots would be quite cool for Snortas. Anyone up for writing some rules for those? Well, I could give it a go.